Early test equipment accomplished remote control by bringing every switch contact to the rear panel. 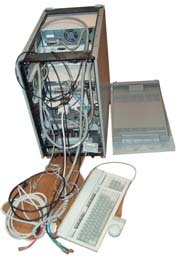 A large bundle of wires were run from the instrument to a card in the computer that was dedicated to that instrument. 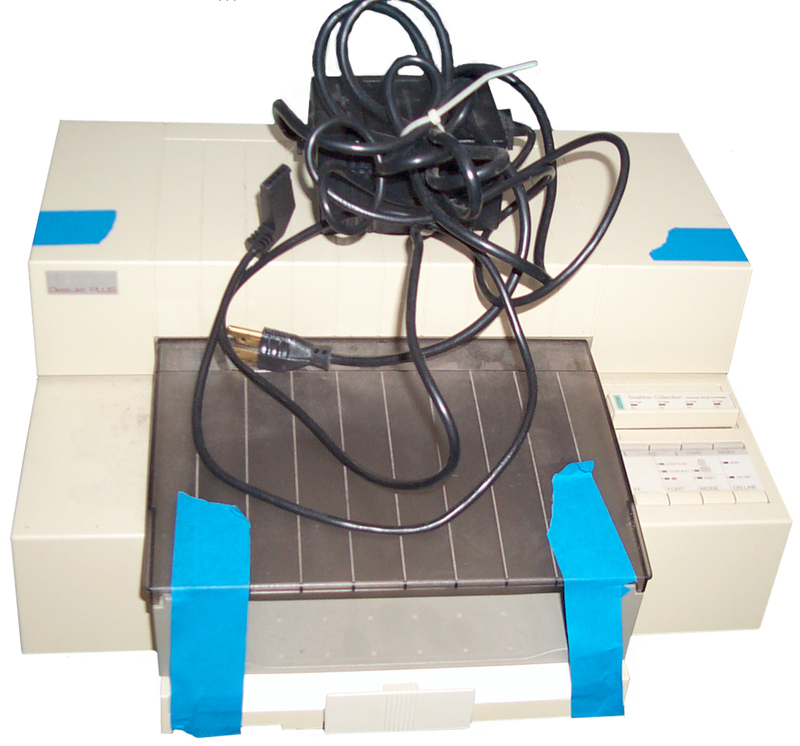 The HP 5100 is an example of this type of instrument where there are about 100 wires in the interface. This was time consuming and expensive so HP invented the HP-IB interface , see US Patent 5327121 (Google patents). This interface uses a two way 8 bit data bus and a number of control lines. It incorporates a three wire handshake so that the slowest instrument on the bus controls the data transfer speed. At some point HP put this patented technology in the public domain and it became IEEE-488. The first version used English threads on the connector and soon a Metric thread version was approved. The metric threads have black screws and nuts. This version only addressed the hardware and electrical level but the 488.2 version added a higher level that includes some basic commands, like *IDN?, and adds a standardized status reporting structure. Note that HP-IB came way before today's common PC so most of the standards that came with the PC did not exist then. 6 Oct. 2003 IEEE 488.1-2003, "Standard for Higher Performance Protocol for the Standard Digital Interface for Programmable Instrumentation" Uses a 2 wire handshake instead of the classical 3 wire. Up to 8 Mega bits per second, compared to the prior 1 MB/S. Is backwards compatible with the prior standards. 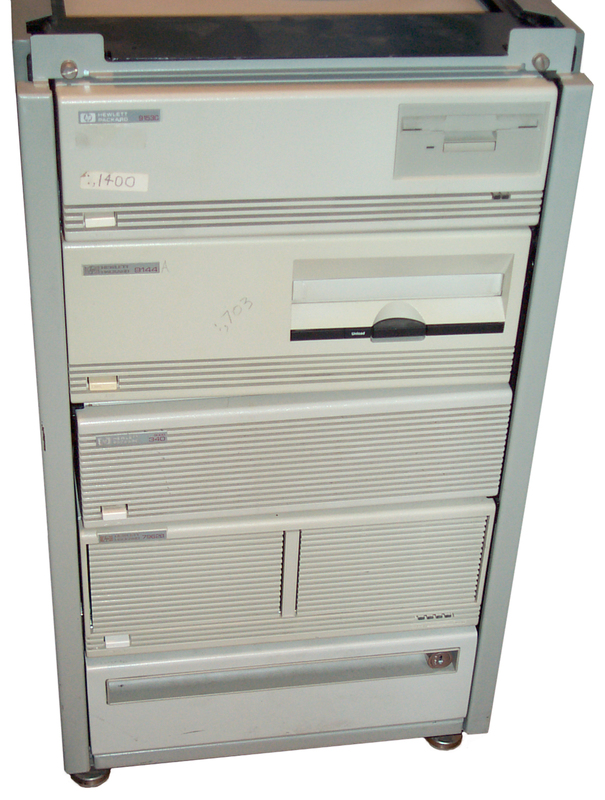 Early systems made by dymec (lower case dy so they could use the small hp logo turned upside down) used DEC PDP-11 computers, but soon HP introduced the 2114 (the smallest rack mount computer), 2115 and the 2116. All used core memory. Later the 2100 was introduced. Although I saw demos of these, I never did use one. 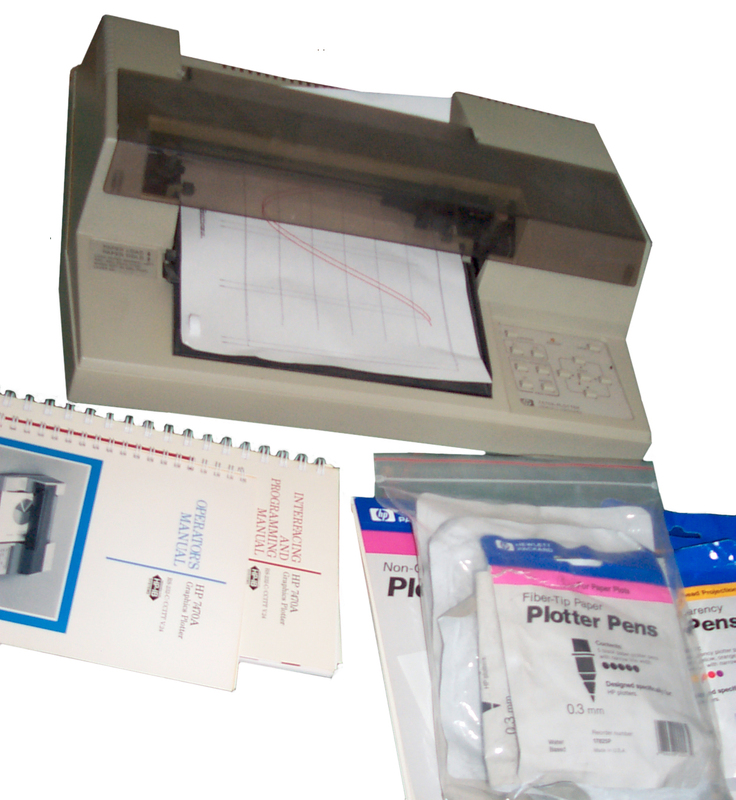 Various versions of 8 level TTY machines were used for human I/O and paper tape was the standard machine I/O method. There was a rack mount tape reader that ran very fast using optical reading of the tape (the TTY machine read the holes with metal pins in a mechanical way). A motorized K&E drafting eraser with the eraser replaced by a shaft and disk was the common tool used to wind up the paper tapes. This would take tens of seconds to wind a 4" diameter roll, but it would take forever to do it by hand. The first HP calculator that I used with the 9100A. It was the first calculator able to work with transcendental functions and both fixed and floating point numbers with a large number of digits of accuracy. Sales brochure at the Silicon Valley Computer Museum. It was followed by the 9100B and then the HP 35 pocket calculator. The HP 41CV was the next scientific pocket calculator. The newest calculator I have that's a direct descendent of the 9100 is the HP 48GX. HP introduced the 80 Series (85, 86 and 87) desktop calculators that had optional HP-IB interface (and other) plug-ins. Although they had computing power comparable with the PC when it later came out, they were still called "calculators" to minimize the red tape associated with purchasing a "computer". I built a number of test systems using these. These calculators have an internal operating system and add on ROM packs can enhance features. Although I think the original purpose for these was to replace the DEC PDP-8 or PDP-11 in what would have otherwise been an all HP rack test system using mainly HP-IB for instrument control they were also used for Computer Aided Drafting (CAD). HP developed the ME10 and ME30 Mechanical Engineering CAD packages for these systems and as late as 1999 Agilent in Santa Rosa was still using this system for many of their mechanical drawings while the rest of the world was using Autocad. This says that the ME10/30 software was very good. The later versions of these Workstations were also capable of running Unix and being networked. There was a version of Adobe Framemaker that would run on the larger workstations. I think the RMB language was developed in Pascal. Pascal was a language designed for teaching computer languages in colleges. When I learned programing at San Jose State they had a language called TUTAC (as far as I can remember) that ran on an IBM machine with punched cards for input. HP used the Morotola 68000 and the follow on versions of this chip as the foundation for a number of their test instruments and also for a number of HP-IB controllers. The 16, 26 and 36 were also called the 9816, 9826 and 9836. These were also known as the HP 9000 model 216, 226 and 236. When the series 300 versions started to appear these were called 200 model 16, 26 and 36. The computer has a boot ROM that looks for operating systems at power up and lists them on the CRT. You then have the option of choosing which op system to run by typing the 2 characters that prefix the description. This multiboot feature is not standard on the PC, but can be added. When the PC came out HP offered an I/O board with a DOS operating system so you could run PC DOS software on the 300 and 800 series WS. The early LAN was called ThinLAN Cable and was a coax based X.25 system. Also offered was an 802.3 LAN using the IBM format. Note that RMB is both an operating system and a language optimized for instrument control. The code is stored in the computer as ASCII text with a header byte. If the code is "protected" one of the bits in the header is changed and then the monitor or printer only shows an "*" after the line number. There's a command (maybe ReadIO and WriteIO) that allow you to Peek and Poke anywhere in memory, so it's possible to change that bit. It's also possible to read the boot ROM and decode it based on the 68000 instruction set. The first version (1.0) of RMB came on a single 5¼ inch floppy disk. Later versions came on 3½ inch single sided floppy disks so the system was booted from either an internal floppy drive or an HP-IB connected floppy drive like the 9121. At maybe version 3.0 (if memory serves) the language was supplied on 3½ inch double sided floppy disks and so an upgrade to the 9122 floppy drive or one of the hard drives with a double sided floppy drive was needed to run the language. There's an add on Basic Plus that provides a family of Graphical User Interfaces that also support color, like on the 9836 or 340 controllers. In addition there's a compiler. Although compiled code may run faster, for most instrument control applications the instrument speed is so slow that a compiled program does not run faster than a interpreted program. But the big advantage of compiling is that each sub program only takes up one line number instead of tens or hundreds of line numbers. This allows writing much larger programs. Test & Measurement Systems Inc. - HP BASIC/WS 6.4 - Sep 2005 still selling RMB and offering support. These used plug in 9000 series Printed Circuit boards to add RAM and other features. 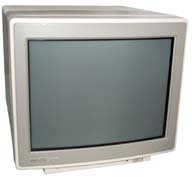 This was the lowest cost system and had a monochrome CRT. It was all contained in the monitor housing but required external disk drives and an HIL keyboard (remember there was no PC then). There were two common keyboards, the small one and the "Nimitz" large one built like a battle ship. The keyboards had a RPG (Rotary Pulse Generator) or knob that could be read by the basic language. The 9816 was designed to have a very small foot print on a desk top. 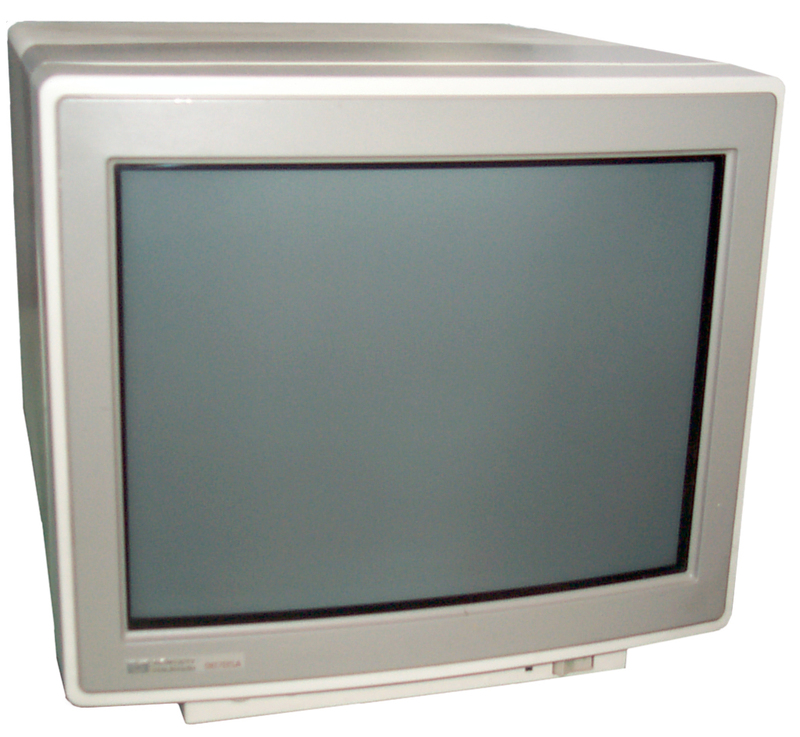 The 26 has a smaller CRT than the 16 but includes a built in 5 1/4" floppy drive. It's designed to be rack mounted so is in that format. These were more expensive than the 16 so I didn't use them. This was the high end version and had the largest screen and built in dual 5 1/4" drives. This was the Color display version of the 9836. 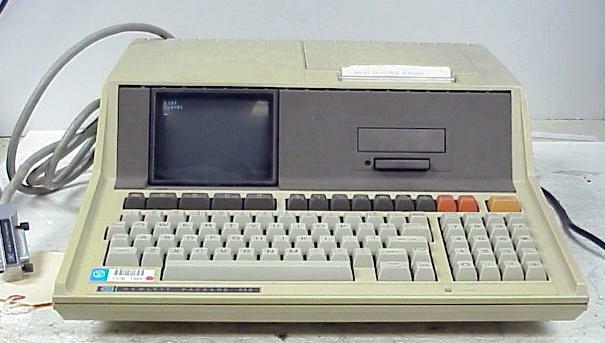 This may have been the first HP computer model to run Unix. It is packaged in the same type of case used for the 300 series computers. A European standard and there's an associated HP rack case for this narrower than 19" format. These were packaged in some metric standard cases and could be racked (not 19"). Instead of Printed Circuit Boards for the add-on functions they used metal boxes. This was a "Diskless Unix Workstation" that retailed for $4995 at one each and was to compete with the Sun "Diskless Unix Workstation". The lowest end HP RMB Workstation cost more like $ 15,000 to 20,000 by comparison. I did some homework and learned that the boot ROM in the 318 was very similar to the boot ROM in the 200 series RMB WS computers, so took a gamble and ordered one. Note that this is just a box and so needs an external monochrome monitor, HIL keyboard and HP-IB disk drive. They have two HP-IB ports built in as well as a serial port that can drive a Desk Jet printer. One of the HP-IB ports is a "high speed" port designed to connect to disk drives and the other port can be used for instruments. Remember that HP-IB runs at the speed of the slowest instrument connected to the buss, so if a slow instrument is on the same bus as the disk drive it slows the drive way down. We ended up buying a number of these for instrument control. This is a RGB color RMB WS and was the one I used in my office. Similar to the 318 but with color and much more powerful than the normal RMB workstations. This was a portable or rack mount (?) RMB WS. Never used one. The keyboard was hinged at the bottom and could fold up to cover the CRT and Floppy drive. The base computer would be configured with different options and accessories depending on the end use. HP-HIL Hewlett Packard - Human Interface Loop had a similar function as the PS2 interface used on PCs except that you could daisy chain up to 6 devices. In 1990 RMB was on version 5.1. This was called the Viper Card AKA Measurement Control Processor, originally 82300 later 82324. Greg Goebel was the primary support engineer for this product. 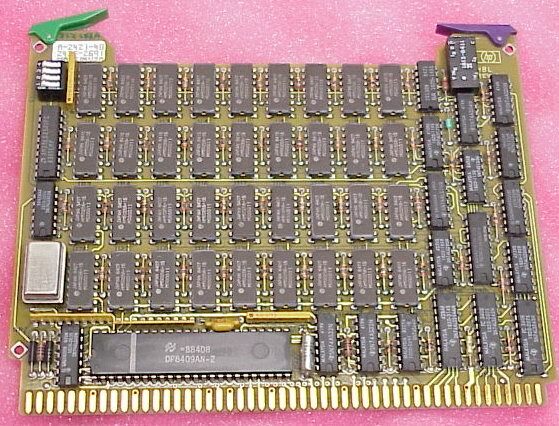 This was really two or three cards cabled toghther with a Motorola 68000 CPU to allow running RMB using slightly modified (or the same) code as used on the 68000 based HP Workstations. The HP Museum has a web page for the 82321 version Viper card. Note that in the case of the PC based co-processor the system 3.5" floppy disks are in PC DOS format, not the HP format used with the RMB controllers. Many HP/Agilent test instruments have an embedded version of RMB. For example the HP/Agilent 4395A combo box (Network, Spectrum, Impedance) analyzer has I Basic. 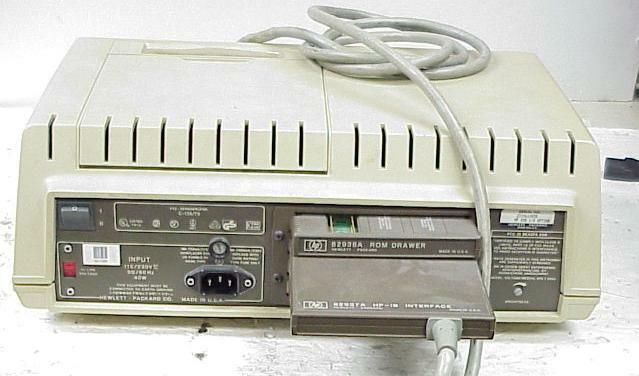 The 4395A 3.5" flopy disk drive reads/writes PC or HP format disk (menu selection). BUT, the instrument version of RMB does NOT include the complex math functions like are in the workstation version. One instrument with RMB built in can control a bunch of other instruments using IEEE-488 (HP-IB) and so a separate computer is not needed. The newer HP/Agilent instruments that use a PC based mother board instead of the traditional Motorola 68000 based mother board don't support embedded RMB as far as I k now. 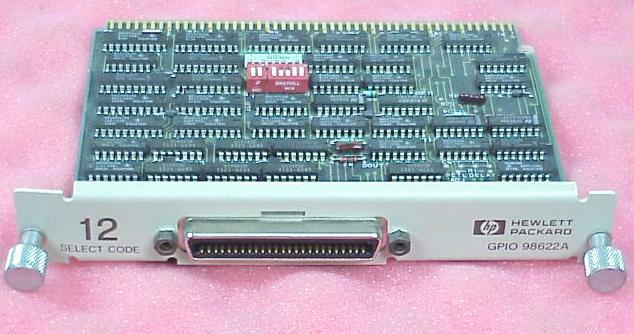 98626A Single port RS-232 typically used for modem, terminal,printer,plotter, etc. The HIL cable has one end marked with a single dot and the other with 2 dots. It needs to be installed matching the number of dots on each end to the device. All the HIL devices (except the mouse) have two HIL sockets to promote daisy chaining devices. The standard interface connection for all these was HP-IB. Note that although the HP 3.5" Floppy drives look very similar to the ones used in a PC but they are different and not interchangable. * When HP first offered DS/HD (1.44 MB) floppy disks I bought a box of 10 for $50 plus tax and shipping. They were black plastic, unlike the prior floppy disks which were light gray plastic. There was an option when LIF (Logical Interchange File) formatting them that allowed controling the size of the index file. The index size would be small if you were going to store a few programs, or large if you wanted to store a lot of samll data files. This was before the existence of the PC. Note: The Rocky Mountain Basic (RMB) versions changed to support the improvement in drives starting with the 5-1/4" then the increasing density of the 3.5" drives. Note: RMB is both a language AND an operating system. Since it runs on the Motorola 68000 family micro processors all it takes is a boot ROM change to make any 68000 hardware into an Amige, HP Work Station, or McIntosh computer. The boot ROM contains a pointer table that assigns memory addresses to the hardware devices. 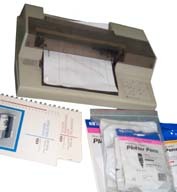 It was using this method that I was able to use the Motorola Assembler and Editor for the 6800 on my South West Technical Products (SWTP) home build computer. This printer has a plain back side and can be positioned flush to a wall. The paper feed and exit is to the front side. On the bottom is a hollow where the power cord and either RS-232 or Centronics parallel cables connect. This one has the Times New Roman plug in font cartridge. It's a black ink spitter with very good quality text and graphics. Note the resolution of a pen plotter depends on the line width of the pen, narrower lines make for higher resolution. Modern laser printers can draw narrower lines and so have much higher resolution than any pen plotter. HP 7440 Two Pen Plotter. The X-axis movement is done by moving the pen left and right, the Y-axis movement is done by moving the paper. Requires some rear paper clearance. eBay search for "HP (16,26,36*,216,226,236,2114,2115,2116,9816,9826,9836,318,340,360,380)" in Vintage Computers.